Ben Robinson|GoBuccs.com Covington’s Brenna Miller gets off a shot Monday against Twin Valley South. Ben Robinson|GoBuccs.com Covington’s Claudia Harrington drives around a defender Monday against Twin Valley South. 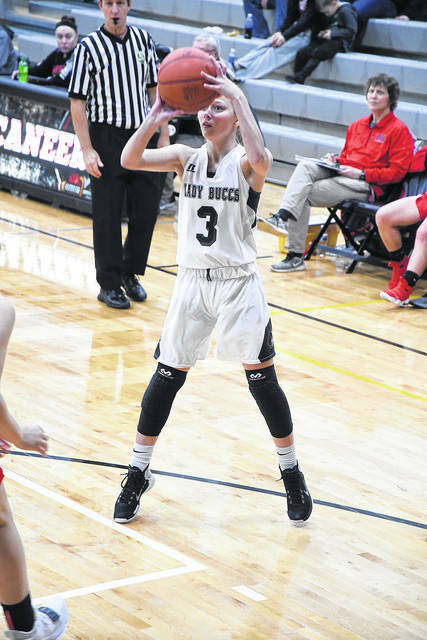 COVINGTON — Despite being 4-1 overall and 2-0 in the CCC after a convincing 66-34 win over Twin Valley South on Monday, the Covington Lady Buccs are still a work in progress. That’s because Covington coach Jim Meyer is trying to find some offensive weapons materialize to go along with senior standout Sammi Whiteman. And Meyer learned more about his team on Monday as other players stepped to the forefront at the offensive end. All but one of the varsity players contributed with points. Whiteman led Covington with a game-high 18 points, while Morgan Kimmel dropped in a career-high 13 points and freshman Claudia Harrington contributed with 11 points – her second double digit scoring effort of her young career. But it was the play of freshman Makenzee Maschino that set the tone in the opening frame as Twin Valley South focused its defensive effort on shutting down Whiteman. Maschino made the Panthers pay dearly by scoring eight of her nine points in the opening frame to spark a 19-5 lead. Huge treys by Kimmel, Morgan Lowe and a pair of treys by Harrington sparked a 25-8 scoring advantage in the second quarter as it opened up some lanes for Whiteman to penetrate the Twin Valley South defense for easy buckets. Leading 44-13, Covington suddenly found itself going through the motions in the second half. 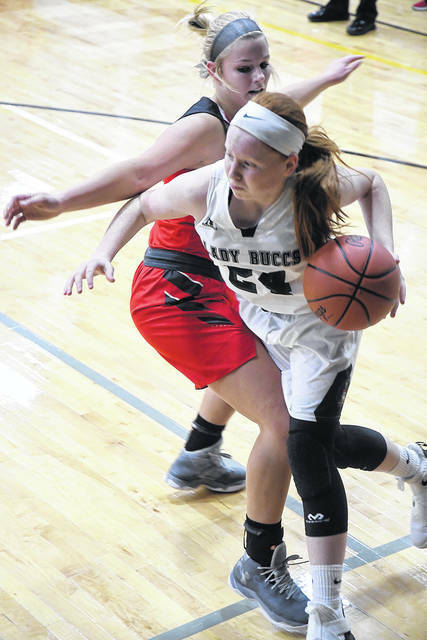 Failing to runs the offense, rebound the basketball and uncharacteristic turnovers became the theme for the Lady Buccs – leading to the obvious displeasure displayed by Meyer. This led to an evenly played half of basketball as Covington only held a 22-21 advantage in scoring after intermission. Still, Covington walked off the floor with its fourth win of the season in five outings and has four days to address its deficiencies before traveling to Troy Christian on Saturday. https://www.dailycall.com/wp-content/uploads/sites/30/2018/12/web1_brenna-miller.jpgBen Robinson|GoBuccs.com Covington’s Brenna Miller gets off a shot Monday against Twin Valley South. https://www.dailycall.com/wp-content/uploads/sites/30/2018/12/web1_claudia-harrington.jpgBen Robinson|GoBuccs.com Covington’s Claudia Harrington drives around a defender Monday against Twin Valley South.